Amid emerging trends, it’s difficult to stay on top of rapidly changing consumer preferences. Healthy living, however, is here to stay. Stores that have a wide variety of healthy food options are consistently ranked higher than those that don’t. Show you are on top of your game with Chef Kit featuring quick, healthy meals that use fresh, in-store products. Meal Kits are highly appealing to millennials, young professionals, families, and foodies alike because they tackle the main risks and barriers of cooking healthy at home with quick-prep meals that don’t sacrifice flavor. You do not need special training to prepare a Chef Kit meal as each meal has been hand-crafted to make gourmet easy. Freshop’s in-house chefs design meals to give customers restaurant-quality meals at home. You’ve already saved your shoppers valuable time by doing the shopping for them via online groceries, and now you’re bringing them dinner. Chef Kit is a convenient way for shoppers to prepare meals at-the-ready with fun ingredients and in-store products. Every Chef Kit features a gourmet recipe prepared in 45 minutes or less with easy-to-follow instructions. Packaging is co-branded with your store, complete recipe details and all the required dry and liquid ingredients. Stores simply open the kits and add the required perishables. With Chef Kit it’s now so easy for busy parents and professionals to try a few meal kits without wasting money on a subscription service. Recipes are designed to be accessible and adventurous. Customers get to try meals like Ponzu Pork and Tilapia Ceviche without shelling out or eating out. They see what goes into their food, they know what they’re feeding their families, and they have peace of mind that they’re making the right decision. And, stores play a crucial role. We know you’re strapped for time and your departments are busy serving customers in stores and online. Chef Kit requires a very small time commitment for grocers because, as mentioned, we provide the packaging, recipes and pre-measured ingredients. You easily add the fresh meat or seafood, and produce. You can also choose which recipes to feature. Browse through Chef Kit’s catalog of more than 30 dinner and 10 breakfast recipes and order recipes based on customer demand, or to move that last bit of product. Have a surplus of salmon? Are you facing an abundance of produce? Just feature various salmon dishes and sides through Chef Kit and you are soon moving extra inventory fast. It’s dinner time! Bring families together by shopping Chef Kit’s extensive meal options and aligning your products with your shoppers. 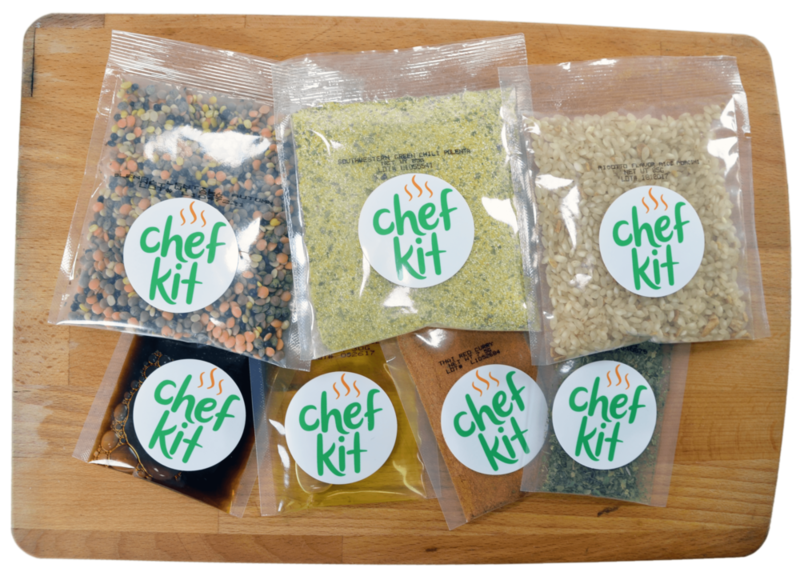 Get Chef Kit on your shelves today by contacting chefkit@freshop.com.